It’s hot. Outside, that is. Here in Atlanta, we experienced a bit of a heat wave last week. When I say a "bit" of one, I mean it was unbearably hot that I had a hard time leaving the house. When its 90 by 10 am (!!! ), my reverse seasonal disorder kicks in and all I want to do is lay around. If it’s too hot for me to put clothes on to go to the grocery store, you know darned well it’s too hot to be actually cooking anything. Thankfully, I am a huge fan of cold summer soups. Gazpacho, in particular. My mom always made it and when I was younger, it was just one of those weird foods. As I got older, I started to appreciate the depth of flavors and its versatility more and more. While I love the pureed, thinner kind…my mom’s version was always a little chunkier, so that’s my preference. 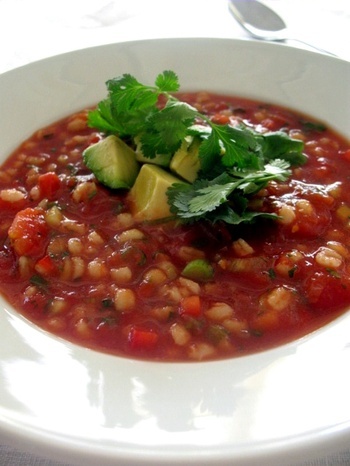 I ran across this version on-line and was intrigued by the addition of barley into the soup. I’ve never had gazpacho with anything but veggies in it. The barley added some oomph to the soup, made it more filling while still allowing it to be light and refreshing. I didn’t use the canned spicy tomato juice, choosing instead to add my own Tabasco and spices. I also substituted a fresh seeded jalapeno for the canned ones. It was delicious the day I made it but I highly recommend letting the flavors stew and percolate together overnight. Interesting! I’ve always used Moosewood’s recipe as the basis for my gazpachos, but I like the idea of adding some grains, too. Wonderful looking and the proper temperature for this kind of heat. I LOVE the addition of grain, is that the secret ingredient? I was going to guess Ouzo. This sounds so refreshing as Chicago is being hit with another wave of muggy heat. And the barley is an interesting call. Marion has already made some of her delicious gazpacho at our house this season. This sounds perfect for this crazy heat that came and hit us like a ton of bricks! :) Yum! Reading about the heat wave on the East Coast has been a little surreal, since we’ve only just climbed out of a loooong slump of gray, rainy 50 degree weather. I finally threw the towel in and started making more roasts and soups and wintry foods, since the kids were coming home from school chilled and needing hot cocoa. I love gazpacho (I’ve never added pearly barley to it; I’ll have to give it a go), and although the weather here has improved (for now), it seems almost impossible that it will get warm enough to make it. I imagine that avocado works nicely in the mix. Speaking of mix, how about a little dash of Ketel One in there? Love the idea of adding grain. I usually go all natural…http://myswizzlesticks.blogspot.com/2008/06/gazpacho-casa-hoey.html But I’m going to try yours next!